It's easy to get overwhelmed when walking into a supermarket. There are so many choices. Most of us know that fresh fruits and vegetables are essential to a healthy diet. We know that fresh fish is important and that we should only eat red meat in moderation. Most of us know that chicken and turkey are best eaten without the skin because that's where all the fat is. What about everything else? There are some basic guidelines to follow that will help us make healthy food-shopping choices. Not only will that support our effort to improve our health or maintain an already good health, but we will be able to have that occasional treat without feeling guilty. It has no known benefits. Its other names are "partially hydrogenated oils and hydrogenated vegetable oils." 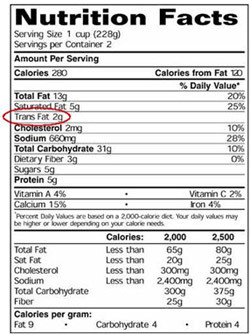 It's not unusual to have a product label state "trans fat free," yet a close look at the list of ingredients will reveal that the item has "partially hydrogenated oils." 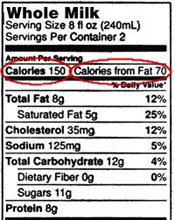 That means that the food product contains less than 0.5g of trans fat per serving. Luckily for all of us, in recent years many manufacturers have removed trans fat from the list of ingredients in processed foods. Peanut butter, for example, used to be a big culprit. Don't depend on what is written on the front of the can or package as there may be surprises on the nutritional label. 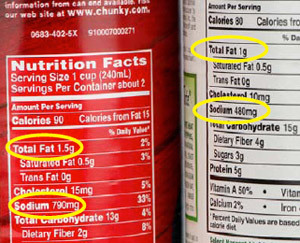 For example, a lite or low-fat product can contain a high percentage of sodium – an ingredient in table salt – which should be avoided if you suffer from heart disease. Even healthy adults should not eat more than 3,000mg of sodium a day, according to the American Heart Association. Dairy products can be high-fat culprits, though they are rich in calcium. Balance your choices. If you occasionally enjoy whipped cream, go for nonfat when you buy milk and ice cream. Some dairy products have high amounts of sugar and fat. Take yogurts, for example, as their ingredients and nutritional values are varied. Non-fat yogurt can be filled with sugar. Check out the plain yogurts. They have become popular and are available in several brands. You can get one of those and add your own fresh fruit when you get home. Dairy products also can contain high amounts of cholesterol, and too much of that leads to heart disease. Try not to eat more than 300mg a day. Saturated fat also increases the risk of heart attack and stroke. Dairy products with high fat content have low calcium content. Compare "like" products. Campbell's Select Harvest brand, for example, has less fat and sodium than the Campbell's Chunky brand. Canned and juiced tomato products usually are loaded with sodium, but there are some low-sodium options from which to choose. Canned soups and vegetables, as well as canned fruits, also demand your attention. Check the labels. If you are on a low-sodium diet or have problems with high blood pressure, it's better to either buy the soups low in sodium or make your own from scratch. Fruit juices are not "fresh fruit." They are loaded with sugar. Be aware of how much sugar you are consuming, especially if there is diabetes in the family. Again, read the labels. Some juices are better than others. When you've got that craving for snack food, find those that are lower in fat and sodium. By checking and comparing labels, you can easily find the ones right for you. Pay particular attention to whether the snack items include trans fat, which has been associated with coronary disease. 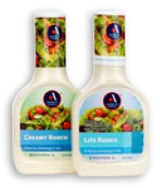 Most commercial salad dressings are fat and sodium culprits. Check the serving sizes. The calories can be as high as 250 per serving, and that's usually for only two tablespoons. How much do you use? Buying any one of a number of vegetable oils and vinegars will allow you to make your own healthier dressings. If you have any questions regarding your health and what you should be eating, please consult your physician. It is very important to recognize your unique personal needs, especially when it comes to what you consume in relationship to what medications you take and what allergies or illnesses you may have.